UPDATE May 2017: Big news regarding WSOP 2017: The Word Series of Poker has killed the November Nine. The final table of the WSOP Main Event won’t be played in autumn like it used to bei from 2008 to 2016. Instead, the best nine contestants will play against each other directly after the WSOP Main Event. The final table will still be played on three consecutive days. Starting on July 20th the nine players will be reduced to six. On July 21st the six will be boiled down to three. And on July 22nd the new champion will be crowned. The first events of this years WSOP will start on May 31st. But you can still qualify online at 888. Register here or continue reading for more information. UPDATE April 2017: As if a multi-million-dollar-prize wasn’t enough – 888poker superzises this years WSOP Main Event. The poker room, official sponsor of the championships in Las Vegas for three consecutive years, has announced to top up the firt-place prize to $10,000,000 if a player qualifies through 888poker and wins the Big One. To be honest: It’s not extremly likely that this is going to happen. But the news is a good marketing gag at least. And it makes the WSOP Satellites at 888poker even more attractive. Read the full news to find out more about how to qualify online for this years WSOP. UPDATE February 2017: The World Series of Poker WSOP and 888poker have agreed to expand the close cooperation. As 888poker announced in a press release in February 2017, 888 and WSOP signed another broad sponsorship and content pact for 2017 and 2018. 888poker will become a leading sponsor of the 2017 WSOP in Las Vegas as well as the WSOP Europe. The most important thing for you, the players: Just like in 2015 and 2016, the official WSOP Qualifier Satellites will be exclusive to 888poker in most international markets. 888 has also committed to support TV-distribution via ESPN and in key European countries. And there will be a 888poker WSOP event again. With $888 buy-in, the Crazy Eights Event will be a true highlight at this years poker championship. Of course, players can win tickets to the event online while playing at 888poker. The WSOP 2017 will take place from May 30 to July 17 in Las Vegas. Qualifier tournaments have begun at 888poker. Click here to read more about the latest WSOP promotion at 888poker. The content below is from 2015. Most of that news is still valid in 2017. UPDATE December 2016: It’s still quite a while until the WSOP 2017 starts. But 888poker has just launched a WSOP 2017 promo you shouldn’t miss. You can win a ticket to a WSOP 2017 bracelet event without spending a single cent. Check out our news about the 888poker WSOP 2017 promo to find out more. [ORIGINAL POST] So far other large pokerrooms like PokerStars or William Hill were offering the qualifiers to the WSOP main events. The online qualifiers are extremly popular as they offer the chance to join the World Championship of Poker in Las Vegas with small buy-ins. The regular tickets, prized at $10.000, are far too expensive for most of the people. With online satellites people like Chris Moneymaker can make it to the main event. The later to come Winner of the 2003 WSOP Main Event paid only 40$ for a WSOP-Satellite at PokerStars. In 2015 have slightly changed: 888poker is now the only pokerroom to offer official WSOP Qualifier Satellites in all countries except US, Canada, Mexico, France, India and Italy. This means: If you want to qualify for the WSOP Main Event, you need an account at 888poker. This doesn’t have to be a bad thing, however. 888poker is one of the best operators worldwide, offering a great desktop software as well as prize winning mobile poker apps for Android and iOS. And the new step satellite structure allows you to join the qualifiers for as low as 1 cent. The new multi-step tournament system will apply for the WSOP qualifiers as well. This means: According to your budget you can join the race for a WSOP-Ticket for a few dollars or even just 1c. Join now and get $88 free If you haven’t got an account at 888poker, we have a most attractive offer for you. As every new player at 888poker, you will get a $88/£20 free Welcome Package just for registering – no deposit needed. On top of that, as a reader of poker-apps.net you qualify for a special 100% deposit Bonus up to $700 (instead of the normal $400). Click on the yellow button above to download the 888 software – your device will be detected automatically. You can sign up from within the App or Desktop software. The fact that 888 and WSOp are cooperating isn’t really now. Caesars Interactive Entertainment (CIE), the company behind the WSOP online sites in Nevada, New Jersey and the UK, has been working with 888poker on a B2C level. 888poker has provided the software for the real money games CIE is offering. “As a true partner with the WSOP on the B2B side where we power their real-money gaming in the United States, this was a logical next step for us to carry the power of the WSOP to our players across all other major markets we serve,” said Senior Vice President & Head of B2C at 888 Holdings, Itai Pazner. 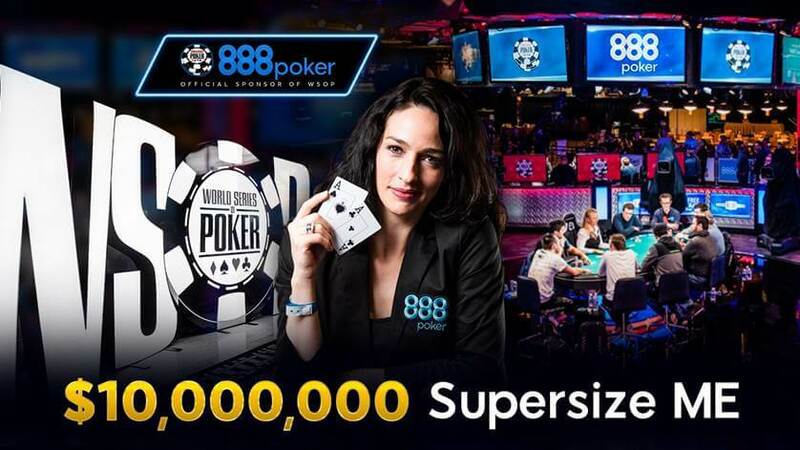 “This broad package gives 888poker players a great opportunity to win their way to WSOP events on our online poker site, plus gives us terrific content and assets to market our brand.” The WSOP qualifier tournaments at 888poker have already started. Download and sign-up here to join the race. [UPDATE 21st of April 2015]: 888 has started another WSOP promotion: New members can win a $13.000 WSOP-Package including the Buy-in for the Main Event (worth $10.000) as well as a seven-night-stay in a Luxury Hotel in Las Vegas. This promotion is on top of the free $88/£20 Welcome Package the exclusive 100% Bonus up to $700, that you get only at poker-apps.net. New players who register during the Road to WSOP campaign from 15th April–13th May will get 2 free tickets to $6.000 Road to WSOP Free Tournaments where they can play to win a $1050 ticket to the WSOP Qualifier. Players who make it to the WSOP Qualifier will play for the $13.000 all-inclusive Package. The promotion is free – no deposit needed.